Editor’s Note: This is the Part 2 of a two-part series. Since it was founded in 1930, the Grand Rapids Symphony has had 14 Music Directors in its history, hailing from nearly a dozen countries around the globe including Great Britain, France, Russia, Spain, Canada, Cuba, Belgium and Switzerland among others. 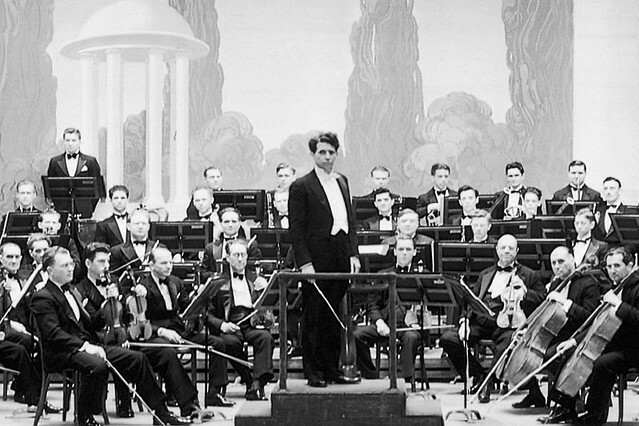 Music Directors came to Grand Rapids from such posts as the Chicago Symphony Orchestra, the Montreal Symphony Orchestra in Canada and the St. Petersburg Philharmonic in Russia as well as having served as assistant conductors under such prominent conductors as Leonard Bernstein at the New York Philharmonic and James Levine at the Boston Symphony Orchestra. Prior to the appointment of Music Director Marcelo Lehninger in June 2016, Grand Rapids Symphony’s past artistic leaders have gone on to hold positions with orchestras including the Cincinnati Symphony Orchestra and the Sydney Symphony Orchestra in Australia as well as academic posts at Northwestern University and Eastman School of Music among others. Here’s more about the Grand Rapids Symphony’s 13 previous Music Directors over the history of the organization. In 1976, Grand Rapids Symphony, now with a budget over $500,000, was officially designated as a regional orchestra by the American Symphony Orchestra League (now the League of American Orchestras). The following season, ticket sales soared as patrons flocked to see Alcantara conduct his final season after he accepted an offer to join the Phoenix Symphony. The Grand Rapids Symphony celebrated its 50th anniversary during the 1979-80 season with Alcantara retained as musical advisor while the search took place for a new Music Director. Russian-born conductor Semyon Bychkov, fresh from graduate studies at Mannes School of Music in New York City, in 1980 became the Grand Rapids Symphony’s 10th Music Director. Within short order, he added 10 full-time musicians to the roster, bringing the number of musicians in the Artists-In-Residence program to 35. The young conductor, just shy of his 28th birthday when he was appointed, displayed a willingness to go above and beyond, whether it was skiing or participating in a hot dog-eating contest, to raise money and awareness for the organization. In September 1980, the long-awaited Grand Center Convention Center with DeVos Performance Hall opened with an extensive community celebration. Though the Grand Center later was torn down and rebuilt, DeVos Hall has remained the principal home of the Grand Rapids Symphony ever since. Under Bychkov, the orchestra performed for the first time in Detroit Orchestra Hall, home of the Detroit Symphony Orchestra in the Motor City. During his five years in Grand Rapids, Bychkov expanded the repertoire of the Grand Rapids Symphony, and the Grand Rapids Symphony hired John Varineau as assistant conductor beginning with the 1985-86 season. Varineau later would be elevated to associate conductor and would become conductor of the Grand Rapids Youth Symphony. One of Bychkov’s personal highlights was becoming a U.S. citizen, taking the oath on the Fourth of July during a Grand Rapids Symphony concert at Ah-Nab-Awen Park downtown near the Gerald R. Ford Presidential Museum. In 1985, Bychkov was elevated from principal guest conductor of the Buffalo Philharmonic Orchestra to its Music Director and left Grand Rapids. One of the most successful conductors of his generation in Europe, Bychkov has gone on to serve as Music Director of the Orchestra de Paris and chief conductor of the WDR Symphony Orchestra in Cologne, Germany. He also is a frequent opera conductor at the Royal Opera House at Covent Garden, at the Metropolitan Opera in New York City, and at the Paris Opera. When Catherine Comet in 1986 became the Grand Rapids Symphony’s 12 Music Director, the appointment made national headlines as Comet had become the first woman to lead a professional regional orchestra in the United States. Two years later, she would be honored with the Seaver/National Endowment for the Arts Conductors Award in June 1988. Under Comet, the Grand Rapids Symphony became the first orchestra in Michigan given the Governor’s Award for Arts and Culture, and the ensemble returned to Detroit for a second performance in Orchestra Hall in January 1988. In 1995, Grand Rapids Symphony unveiled its Picnic Pops Series, now known as the D&W Fresh Market Picnic Pops Series, Cannonsburg Ski Area. During her 11 year-tenure, the second longest in GRS history, the orchestra launched several new concert series including Casual Classics (now Great Eras) and Coffee Classics Series both in St. Cecilia Music Center. The orchestra in October 1987 created a Family Series for elementary school-age students and their families and a Lollipop Series for pre-school students and their families. Determined to nurture the orchestra and to showcase its players, Comet regularly and frequently engaged the Grand Rapids Symphony’s musicians as soloists on the Casual Classics and Coffee Classics Series and for many years on each opening concert of the Classical Series in DeVos Performance Hall. Equally determined to raise awareness of homegrown music, Comet set out to include at least one work by an American composer on every concert. The Juilliard School-trained conductor focused much time and attention on contemporary music by modern composers, premiering works by Donald Erb and Libby Larsen as well as by former Grand Rapids Symphony violinist Steven Smith and current assistant principal oboist Alexander Miller among others. During Comet’s tenure, the Grand Rapids Symphony received two ASCAP Awards for innovating programing. Using the funds from her Seaver/NEA award to finance the project, Comet led the orchestra in a recording of contemporary composer David Ott’s Symphonies Nos. 2 and 3 for Koss Classics, released commercially in April 1993. The Grand Rapids Symphony would go on to make two more commercial recordings for Koss Classics. A recording of three separate concertos for clarinet, violin and trombone by Erb, featuring clarinetist Richard Stoltzman, violinist Miriam Fried, and Ava Ordman, then principal trombonist of the Grand Rapids Symphony, was released in July 1995. The French-born conductor also led the orchestra in a recording of Symphonies Nos. 1 and 2 of Camille Saint-Saens. A highlight of Comet’s tenure was a performance of Gustav Mahler’s Symphony No. 8. Dubbed “Symphony of a Thousand” for its size, more than 400 musicians participated in two concerts in DeVos Performance Hall plus a third in Hill Auditorium at the University of Michigan in March 1997. In 2000 the orchestra toured Northern Michigan and the Upper Peninsula and launched a self-produced recording of music of Aaron Copland including “A Lincoln Portrait” narrated by Richard M. DeVos. New music premiered by the Grand Rapids Symphony included Adolphus Hailstork’s Symphonies Nos. 2 and 3, the latter of which was dedicated to Lockington. The Grand Rapids Symphony later would record both for a CD released commercially by Naxos in 2005. In 2003, the orchestra returned to Detroit Orchestra Hall for a performance, this one marking the opening of the new Max M. Fisher Music Center, encompassing the historic orchestra hall in downtown Detroit. In 2004, soprano Kathleen Battle joined the Grand Rapids Symphony to open its 75th anniversary with a special concert. That season ended in May 2015 with the Grand Rapids Symphony’s New York City debut with a critically acclaimed performance in venerable Carnegie Hall featuring Lockington’s wife, violinist Dylana Jenson, and an encore of Alexander Miller’s celebratory “Fireworks” for orchestra. In 2006, the orchestra recorded “Invention & Alchemy,” a CD and DVD with jazz harpist Deborah Henson-Conant in DeVos Hall. The DVD would be seen frequently on PBS-TV, and the CD would be nominated for a 2007 Grammy Award for Best Classical Crossover Album. The Grand Rapids Symphony in 1962 created its adult Symphony Chorus. In 2008, the organization launched the Grand Rapids Symphony Youth Choruses, a set of training choruses plus a top level chorus and select ensemble, Mandala, both of which have performed frequently with the Grand Rapids Symphony itself. In 2010, Lockington created a Sacred Dimensions series with concerts held in area churches, college chapels and other houses of worship of various faiths. During Lockington’s tenure, the Grand Rapids Bach Festival, a biennial festival held in the spring of odd-numbered years, became an official affiliate of the Grand Rapids Symphony with Lockington as its artistic director. In May 2015, Lockington conducted his last concert with the Grand Rapids Symphony as Music Director with a performance of Mahler’s “Resurrection” Symphony No. 2. After 16 years of service as Music Director, the longest directorship in the orchestra’s history, the British-born conductor was named Grand Rapids Symphony’s first Music Director Laureate. The title, a lifetime appointment, usually is bestowed only on directors who have had a long and transformative association with an ensemble and who will have a continued association with it for years to come. Marcelo Lehninger, a native of Brazil, was appointed the Grand Rapids Symphony’s 14th music director in June 2016. Two guest appearances with the Grand Rapids Symphony, first in February 2015 with Antonin Dvorak’s Symphony No. 9 “From the New World” followed by Ottorino Respighi’s “Pines of Rome” in April 2016 sealed the deal. Due to previous commitments, Lehninger conducted just five concerts in Grand Rapids during his inaugural season, three in DeVos Hall, one is St. Cecilia Music Center, and his debut at Cannonsburg Ski Area for the Grand Rapids Symphony’s D&W Fresh Market Picnic Pops in August 2017. But coming soon, Lehninger, now new resident of West Michigan, will be on the podium for 11 concerts in the Grand Rapids Symphony’s 2017-18 season.